Many of the health challenges confronting our region are so complex that no one organization can solve them alone. That’s why the Southern Tier Alliance brings together top executives from many sectors to work on health improvement. The new planning group is looking for solutions to health challenges in Chemung, Schuyler and Steuben counties. “State and federal grants are attracted by such collaborations across counties, and this planning effort puts us in a position to be awarded new grants,” said Dr. Jim Schuppert, director of health services at Corning Inc. and a member of the Southern Tier Alliance. Kudos to the City of Rochester, Rochester Regional Health, Ibero American Development Corporation and Trillium Health for helping people struggling with drug addiction get immediate access to treatment. Under the “Street to Treatment” pilot, Rochester Police Department officers will transport people seeking help to Rochester Regional Health’s Evelyn Brandon Center. Rochester Regional Health is also collaborating with the Town of Gates and the Gates Police Department to offer treatment referrals at a new drop-in center. “Street to Treatment proves that community partnerships can save lives,” said Trilby de Jung, CEO of Common Ground Health. 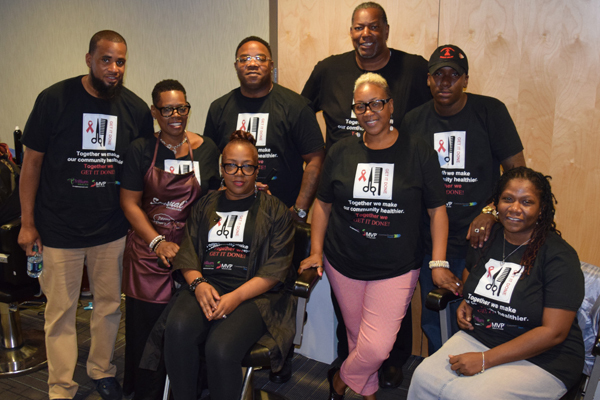 Cutting edge work: During the Sept. 18 Hair and Health Symposium, barbers and stylists who serve as community health educators shared with more than 150 of their peers how they offer blood pressure, HIV and Hepatitis C screenings at their salons and barbershops. They also cut and styled hair for the hair show. See photos from the event here. Read the Democrat and Chronicle's story about the event here. Clinicians: join us Sept. 27 at Corning Inc. for new insights on treating high blood pressure, one of the quality metrics that is critical to your medical practice's reimbursements under value based payment. Sign up here. The Health is a Spiritual Matter: Families Living in Wholeness of Mind, Body and Spirit Conference Oct. 7 brings together dynamic speakers and a panel of experts for a day of workshops and worship for families. The event is organized by the Interdenominational Health Ministry Coalition and supported by the Greater Rochester Health Foundation and the High Blood Pressure Collaborative. Details and registration here. "Foodlink's ongoing work represents a new direction in food banking — a shift from simply storing and distributing food to addressing America's hunger crisis by focusing on ways to alleviate poverty as well as providing healthier foods." Read the NPR feature Beyond pantries: This food bank invests in the local community.